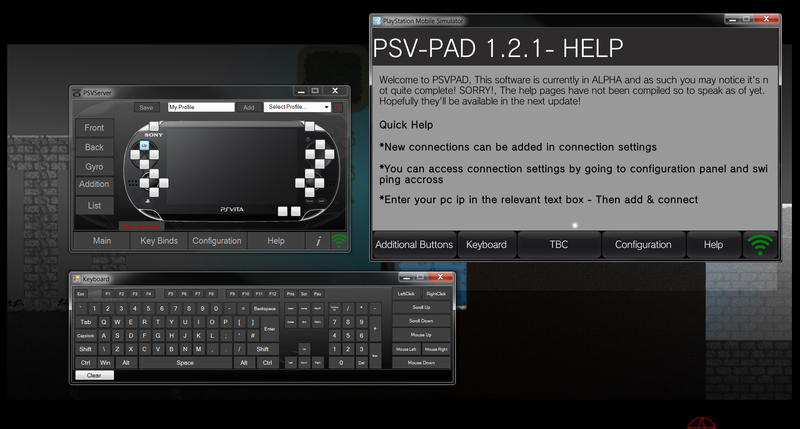 This program allows you to use your vita as a game-pad for your PC. It requires both your vita and pc to be connected to the same network, I can confirm it will also work over adhoc connections if you prefer though not a necessity. Currently the software has only been tested on windows 7 but it should work on windows 8, and may work on earlier windows operating systems but is untested. Whats included in the download? ITS AN ALPHA BUILD WILL IT WORK WHO KNOWS?, THAT’S WHY WE’RE HERE? does work over ad hoc connections. Tested and works on Windows 7 + Windows 8 may work on other windows operating systems but untested. Instructions are included with the download. Any bugs please report them. >>Please note this software is still in development as the time of writing this and as such you may find parts of the software are either incomplete or excluded completely. 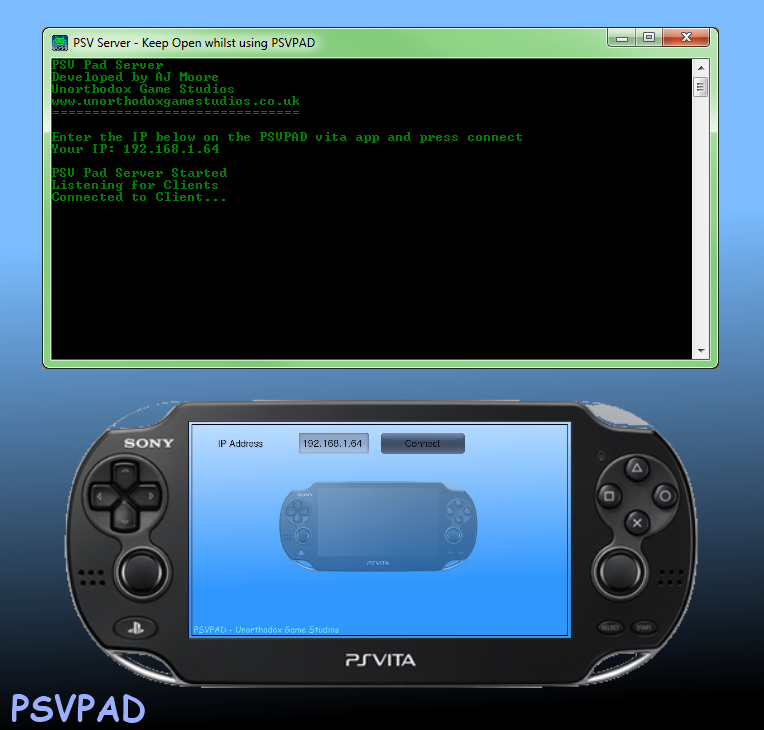 The version of PSVPAD included in zip has not been compiled to save space and ensure that the project is built before being deployed to the vita, as this in the past has been somewhat of an issue for many people. YOU CANNOT AS OF YET SAVE, ADD PROFILES ON THE SEVER, NEITHER WILL CONFIGURATION SETTINGS BE SAVED (IN DEVELOPMENT). The instructions are somewhat lacking at this point in development so you’ll have to figure some of it out yourself. Please check the bottom here of this post for details about known issues. sound is currently excluded – no plans for future integration however.. has been successfully achieved with little overhead. If only one connection in list selecting it does not update the name and ip address in boxes – however will still connect if the user presses the connect button. 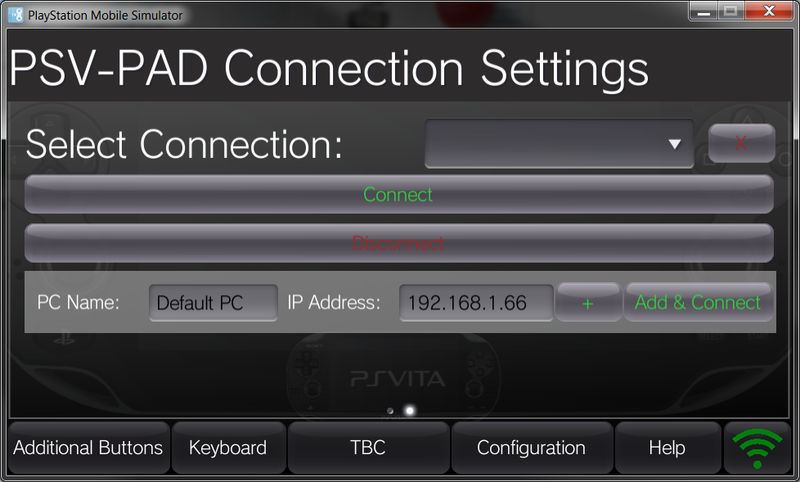 The default connection is not shown when the psvpad application first loads up -> note the default connection is considered to be the last connection you connected from. Binding the mouse movement may result in stutters, It’s not a bug as such just the mouse smoothing has yet to be implemented but is on the list for future developments. 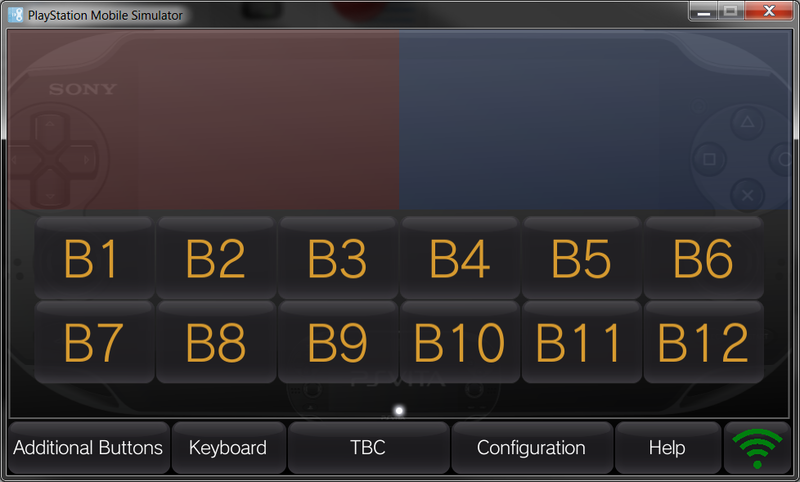 Potentially some keys on the on screen keyboard on the server software may not work as intended. If it says your connected on both the vita and server but it doesn’t seem to be working at all, its quite possibly a firewall issue, you need to add the server software as an exception. Random errors? Any others let me know. First make sure Playstation suite is closed. But in all seriousness I should probably go over the current status of the software, what is include, whats still in development, and whats included but not as of yet functional. 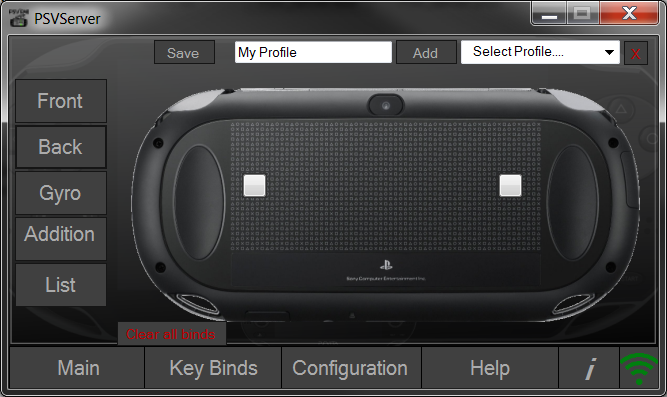 Added the ability to be able to bind controls/ input on the playstation vita to keyboard and mouse events. I would say its about 90% functional, there is still a few issues/ drawbacks with it, but it however does provide a reasonable alternative to third party software if this is the functionality you require. 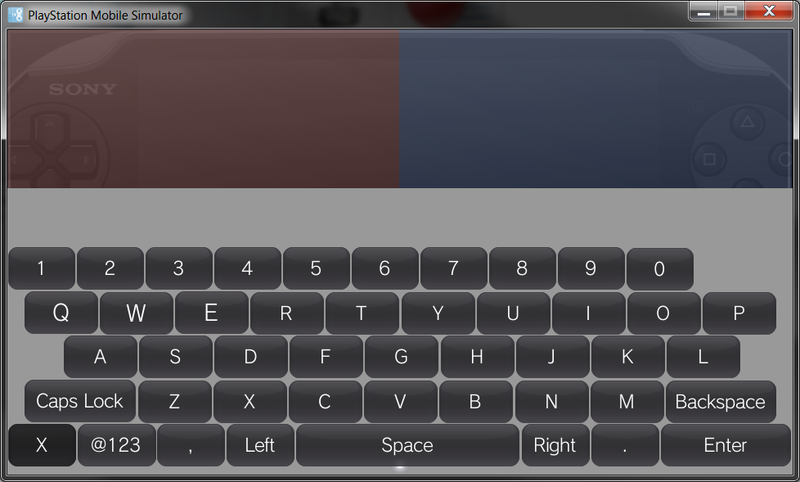 It’s sadly based off UK keyboard layout, but that shouldn’t be too much of an issue hopefully -_-. Anyway carrying on so what inputs can you bind…so far anyway? 3. 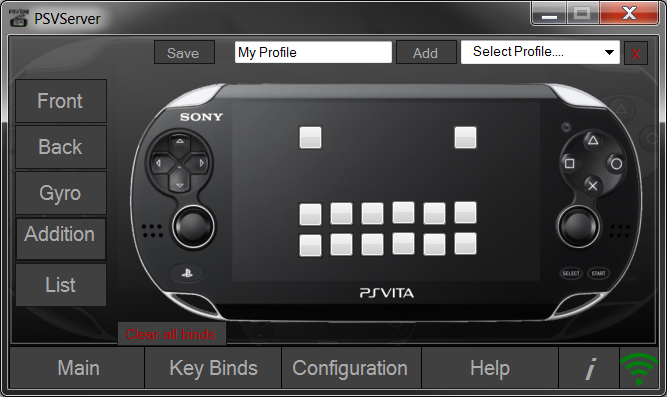 You can even bind to the vitas motion sensors, if you can work that out… and find a valid use for it. 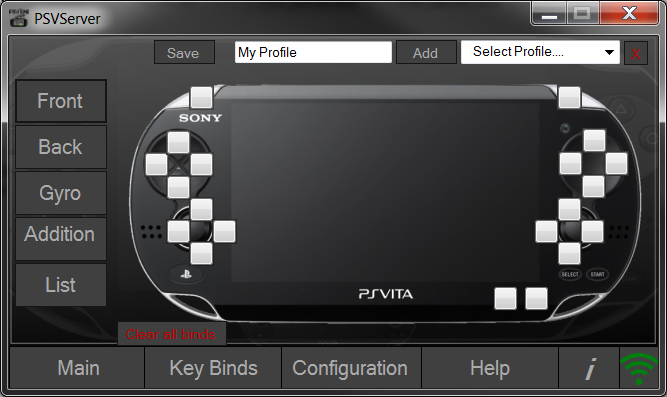 Its certainly possible to use and has been tested against Next Car Game and Dirt3… I’m not going to explain how to set it up, I shall leave it to people to play… If you do want to use the vitas motion, you’ll need to ensure that the gyro is enabled on the vita app, as-well as enabling the axis’s in the configuration on the server, they’re disabled by default, …well all hell would break lose if they weren’t because there basically always active… But I would suggest TAKE CAUTION… just to point out but, they also emulate 3 separate joy axis’s.. I’d just keep them disabled unless you plan on using them. 5. 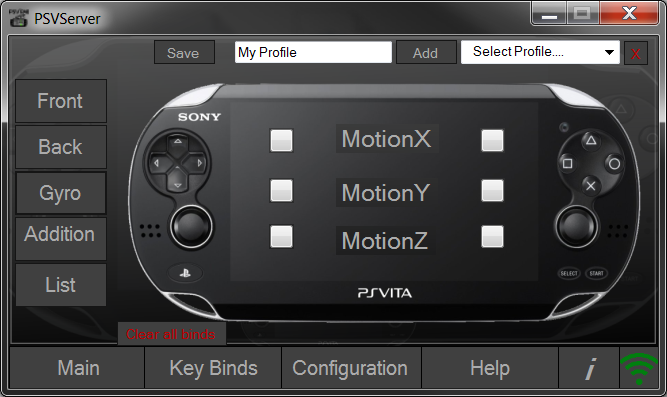 I must also point out its entirely possible to set up all these binds in xpadder if you prefer… I included a profile for anyone that does own xpadder and would prefer to use that, all binds are ready set up… accept for the gyro binds.. which I would suggest you set the axis manually in xpadder if you do… As a NOTE: I use the latest version of Xpadder taken from the developers website, you may find that older versions don’t work quite as expected. 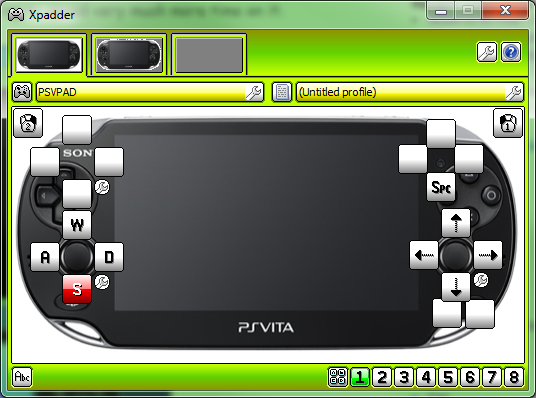 Finding the vita didn’t have enough buttons? well this might just help, it adds an additional 14 buttons to the vita which act as joy buttons and can be bound just like any other button on the controller… I must remind people I posted this as an alpha release so anyway a minor issue went unnoticed with the additional buttons which I will try to resolve with the next update… The problem being that if you press a button then move your finger horizontally across the screen in either direction it’ll result in the button staying pressed as such… well as far as the servers concerned… this doesn’t happen when you move your finger vertically… I couldn’t tell you why exactly.. but yes it is one to look out for. yes one of the latest additions is in fact a pop up keyboard, which in fact acts just the same as a normal keyboard in windows… accept somewhat lacking. The keyboard is still to be completed and provides just the basics for now. Finally a way to save you connection, once you’ve added a connection it’ll be saved simple, then in the future it’s just a matter of selecting the connection in the drop down box and clicking connect next time you use it… though if you IP changes for whatever reason it may mean you have to enter the details again sorry.. Auto connect is disabled for now. Considering setting up the auto connect so you never have to enter an IP at all, but if multiple versions of the software are running on the same network… you might just run into issues… we shall see. Although mentioned previously if anyone bothered to read all this, Functionality has been added so you can use the vitas motion sensors. Only a day ago I had the mad dream of being able to play games on my pc using my vita as a controller… and now I can. The application is very basic but seems to do the job. Right so I’ve spent little more than a day putting this together in total it probably only took a few hours but I kept having to test it which is time consuming especially when you go off on a tangent and start playing games so the time did add up. I had no real interest in a long term project or anything this was just a one off and for this reason its unlikely to change much and I’m not going to spend very much more time on it. Just to be clear the application works by connecting to your computer via a local network generally, so a good connection is needed in order for it to run smoothly. There is actually a set of instructions in the rar for people who are unsure. So here’s the download link. Update: I’ve just made the changes so that it’ll now work with PSM v0.99, I’ve also made changes to the server software and fixed some bugs.